Honestly, at this moment i already lost count on the exact day of us being in Korea. HAHA my bad for postponing this travelog for almost 2 years! well, based on my notes and the photos, this whole visit was happening on the 3rd last day where we aimed to cover some of the popular tourist attractions in this city as much as we could! The landmark of Seoul which located up on the Namsan Mountain (236m). this tower is basically a communication and observation tower and marked as the second highest point in Seoul. visiting this place is like a highlight of your Seoul trip because it won't be completed if you doesn't put this place in the list. We actually stayed in Chungmuro which is a neighborhood of Myeong-dong. so, we just literally walked for almost 25 minutes from our home straight away to Namsan mountain. It was quite a tiring walk as you need to climb up towards the slope as to finally reach that Namsan Cable Car. Opt 1 : Stop at Myeong-dong Station (Seoul Subway Line 4) and Exit 3, 15 minutes walk on the right side of the Pacific Hotel. thanks ajumma whos out of sudden offering her hand to snap this perfect photo! "Artistic" would be my first impression when strolling around Bukchon. Apart for being one of the famous and compulsory place to visit, Bukchon also known as one of the luxurious area in Seoul. Traditionally, this area is a residential quarter of high ranking government officials and nobility during the Joseon Dynasty that now become a traditional culture center. We both love this place as it is calm (although always pack with tourist!) 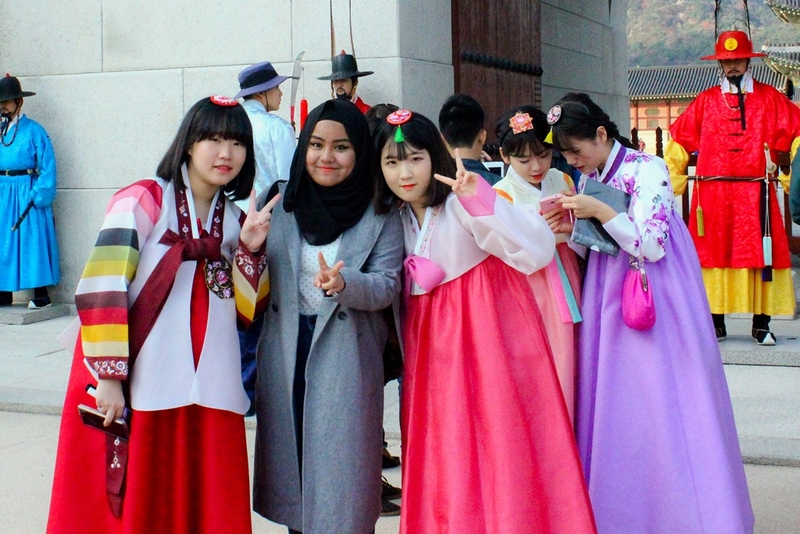 but you can just wondering around the whole area on your own favor or following the maps "Bukchon Hanok Village Photo Spots" and trace all the highlight views in Bukchon. HAHA again, we skipped that part and just trusting our own instinct and getting lost in each alleys till finally bumped onto a SUPER CHIC coffee cafe with a SUPER PRETTY rooftop. Mutually agree to eventually resting our feet and fulfilling our caffeine urge. more on the cafe later on separate post, please anticipated for it yar! Opt 1 : Angguk Station (Exit 2) Walk straight from the exit about 300m? Opt 2 : Just a walking distance from Gyeongbokgung Palace. so, it is highly recommended to make this place after visiting the palace! Duration? Lets say 2 or 3 hours for strolling and photos? 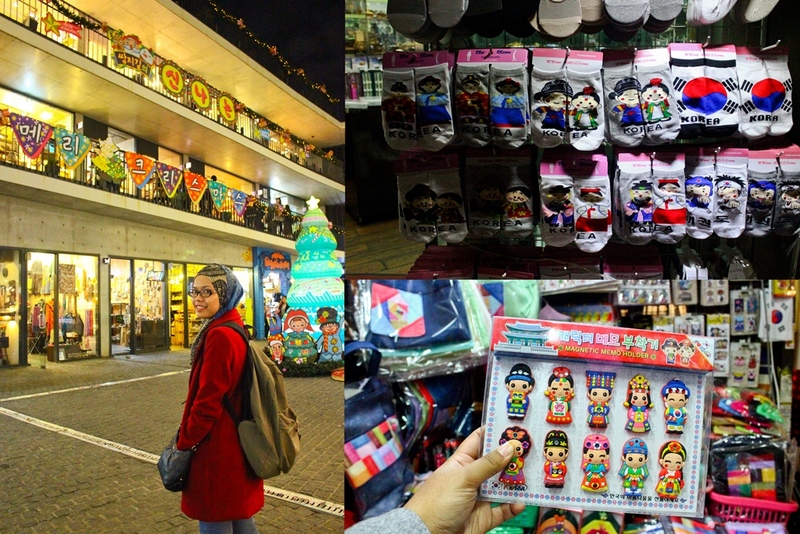 Claimed to be a culture and crafts aplenty, Insadong is a organised and clean area. we found this place is just a walking distance from Bukchon, so why not? based on our reading, this is also a suggested place to find souvenir HAHA but not really agree to the fact as the price is quite pricey. so, i'd absolutely agree to Tripadvisor's recommendation of Namdaemun market to find "Cheap and Best Souvenir" instead of this Insadong. Opt 1 : We just following the Google maps and walked from Bukchon hanok village. OMG finally, i successfully published this 2nd last part of Seoul travelog which took me about 1 month and plus plus! HAHA despite the busy schedule i had, my lappy is sick, so it kills the blogging mood. please pray that i manage to finally wrap up this Korea travelog so that i could jump to another story. HAHA more in the draft though -> Europe 2nd tour with mom, Jogjakarta, Cambodia road trip and Hong Kong VOLUME 2.0. GOSHHHHH, #PrayForSuzai Thanks for reading peeps, hopefully it helps in planning your Korea itinerary, Happy travel! Amboi amboi amboi, gambar OOTD memanjang. Bila la dapat travel sekali. Mesti best bebel bebel sambil ambil gambar. BHAHAHA! Teringin nak p sini! Tapi duit dalam bank kena banyak dulu baru nak pergi sini, sobsob...Gambar suzai semua meletop kebabom! alahaiiii.. bila la nak sampai Korea ni. Teringin nak pi sana.. Eh, sempat makan street churros tuuuuu... sedap tak churros kat sana?? Huu...berangan nk pg Korea tp entah bila yer?Kena simpan duit duit.